The Fixxxer Glock Front Sight Tool is similar in shape to the Glock Disassembly Tool. The Fixxxer Glock front sight tool is designed to assist dealers, armorers, and users replace the front sight of their Glock pistol. What should be a fairly simple procedure can turn into a nightmare project if your selected tools aren’t up for the task. The Fixxxer Glock front sight tool is specifically designed to enhance the ability of users to complete a front sight replacement and installation with ease and confidence. Standard Glock pistols come with a white, 3-dot configuration without any illumination. Glock pistols do have the option of upgraded night sights, in the same 3-dot configuration, for an up-charge at purchase. Glock has been somewhat criticized for not offering night sights as a standard feature as many of their competitors have. Many shooters today prefer an illuminated pistol sights, instead of simple white painting sights. In addition, the modern shooter often prefers sights that provide a contrasting sight picture rather than the front and rear sights having the same shape (most often a dot) and same color (often white or green). EDITOR’S NOTE: BlueSheepdog purchased our Fixxxer Glock Front Sight Tool. We do not sell advertisements, and do not conduct paid reviews, so we can provide objective reviews of products. However, we do participate in the Amazon Affiliates program. Clicking on links in our posts, and buying products from those links, provides funding that literally keeps this site operational. If interested in buying, please consider using one of our links. The new Kershaw Duojet offers an impressive everyday-carry (EDC) knife. Kershaw Knives has released their new Duojet folding knife, and we have the opportunity to bring you a review of this really fine knife. The Kershaw Duojet is an every-day-carry (EDC) folding knife with Kershaw’s SpeedSafe® assisted-opening feature providing a very smooth and solid opening. The Duojet offers a quality chrome-moly blade with carbo-nitride finish, paired with a titanium carbo-nitrite handle with attractive carbon-fiber inserts. The Kershaw Duojet is just one of (16) new knives Kershaw has brought to the market in 2018. This is a remarkable and powerful statement about Kershaw’s dedication to remaining competitive in a knife market that has really exploded in engineering and aesthetic features over the last 20 years. The Pennsylvania State Police are one of the oldest law enforcement agencies in the U.S. (photo PSP). In November, 2017 two Pennsylvania State Police Troopers were involved in a harrowing fight for their lives with a drug-induced motorist intent on killing them. The incident began when a Trooper conducted a vehicle stop of a speeding motorist on Route 33 in Nazareth, a town near Bethlehem, Pennsylvania. Stopping motorists committing a traffic violation is one of the most common enforcement actions for Troopers, and local officers as well. During the course of the contact the Trooper began to suspect the driver was impaired on drugs, and requested a second Trooper to respond. When the Troopers went to arrest the motorist, a life-or-death struggle ensued, where the suspect violently resisted arrest and even attempted to disarm the Troopers. Despite being shocked with the Taser several times, and physically struck multiple times, the deranged motorist was able to free himself from the Troopers and retrieve a handgun from his vehicle. During the shootout that followed both Troopers were wounded, and the suspect would be shot multiple times as well. CrossBreed’s SuperTuck IWB holster is one of the most comfortable on the market. CrossBreed® Holsters has made a big impact on the holster market in a short amount of time. One of their most popular Inside-the-waistband (IWB) holsters is their SuperTuck® holster. Recently, we purchased a SuperTuck to give this popular IWB holster a go around. CrossBreed holsters feature premium leather backings paired with custom-fit molded Kydex holster. The CrossBreed SuperTuck IWB holster has dual SnapLok powder coated steel belt clips to keep the holster secure during a variety of carrying conditions. CrossBreed Holsters was founded in southern Missouri by avid shooter Mark Craighead in 2005. Mark had collected the proverbial “box of holsters” before stepping off on his own to make a better concealed carry holster. Mark incorporated the best features of many holsters into his trademark SuperTuck holster, and with great fanfare. 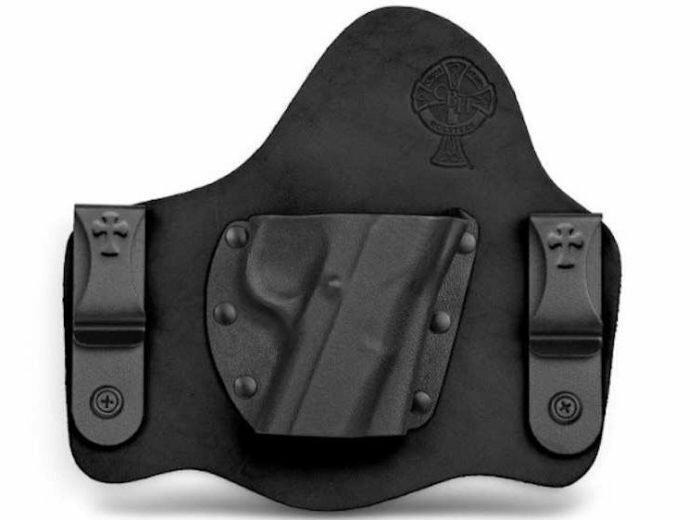 CrossBreed Holsters proudly confess their namesake is in honor of the Lord Jesus Christ. In Mark’s words, “Go big or go home.” Sadly, Mark passed away from a massive heart attack in 2012 at the all-too-young age of 43, but his holster designs and company continue to provide shooters some of the best concealed carry options on the market. The Ameriglo Agent night sights were a great addition to my Gen 3 Glock 22. 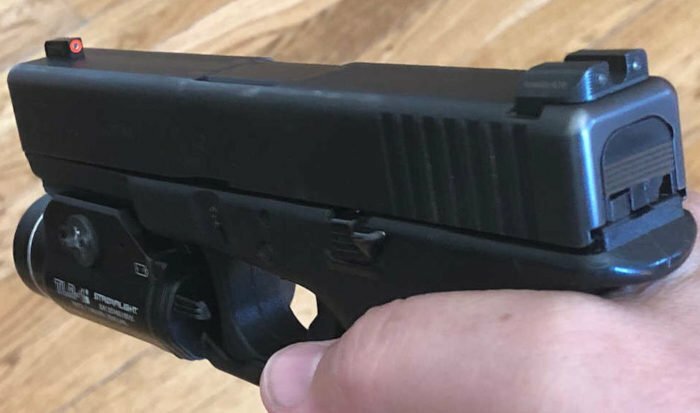 Recently BlueSheepdog obtained a set of Ameriglo Agent night sights to test and review on a former police-issue Glock 22 pistol. The particular sights we acquired come with an orange front sight and green 2-dot rear sight. Ameriglo sights form a familiar 3-dot sighting system that were developed in part to satisfy the requirements for a Federal law enforcement contract (FBI) for special agent handguns. The Ameriglo sighting system offers their unique enlarged front sight, with the benefits of Tritium for quick and sure targeting in low light situations. Ameriglo is one of America’s leading pistol sights manufacturers, and their unique pistol sight designs have been very popular among shooters. The use of Tritium for weapon sights has been around for a couple of decades now, and has greatly enhanced the ability of shooters to acquire a solid target picture in low light conditions. Ameriglo improves that sighting picture through their unique and enlarged front sight design. EDITOR’S NOTE: BlueSheepdog does not sell advertisements on our site, and we do not have any affiliation with Ameriglo or the other product manufacturers mentioned in this article. This allows us to make honest and objective reviews, without the influence of advertising sponsors. BlueSheepdog does participate in the Amazon Affiliates program. If you make a purchase from one of our embedded links, Amazon pays us a type of finder’s fee. These payments literally keep this site up and running, and do not affect the price you pay.